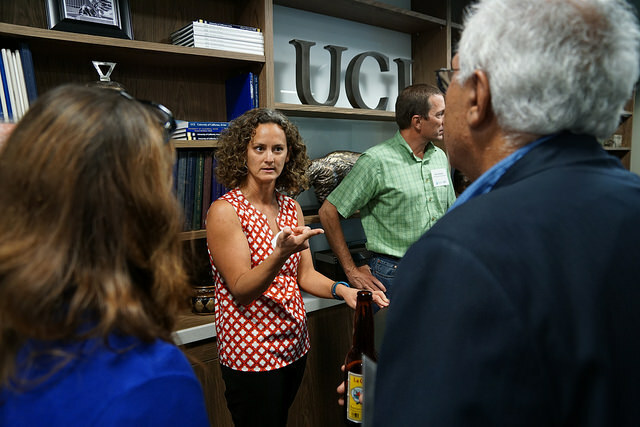 We recently talked to Abigail Reyes, Director of the Sustainability Initiative at the University of California at Irvine, about how our tools have helped her create cohesion and alignment among working groups, identify and address inequities, and teach leadership skills. 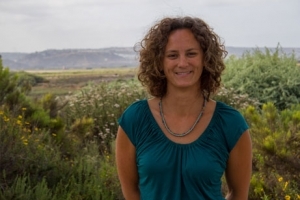 Almost all the work of the UCI Sustainability Initiative is about proposing, designing, or implementing change, and Abby uses many of our tools on a routine basis. The UCI Sustainability Initiative works to transform education, research, and community engagement regarding sustainability and climate at UC Irvine and across the 10 campuses of the University of California. 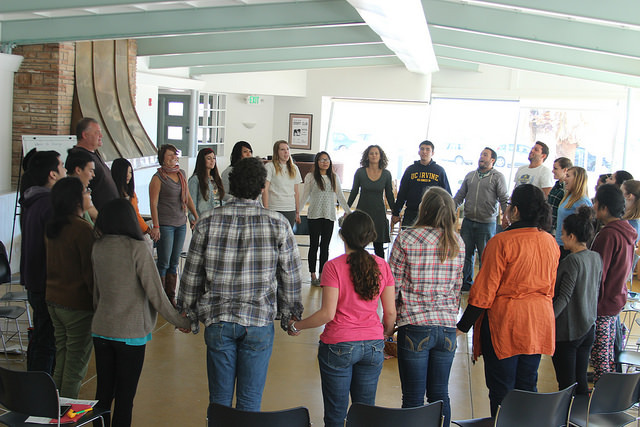 The Sustainability Initiative promotes collaborations with diverse communities on and off campus in developing solutions to challenges affecting California and the globe. 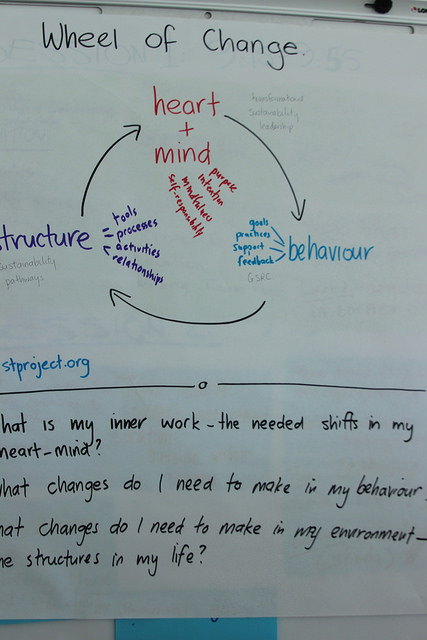 A version of the Wheel of Change from the UCI Global Student Resource Center’s retreat. That involves integrating disciplines that are usually siloed, building trust and common purpose across difference, and working outside of peoples’ comfort zones. The skills needed to do this kind of “integrated, equity-oriented, deep change work” are not traditionally emphasized in a university setting. Abby uses STP’s tools to make those skills concrete for the students, faculty, researchers, staff, and community members she works with. “A lot of that shows up in the way we run meetings or facilitate group process, and in the prioritization of relationship building,” Abby says. Here are just a few of our tools that Abby uses regularly, with examples of how they have helped Abby’s team engage meaningfully and respectfully with some of the complex challenges we all face. Our tool, Creating Team Agreements, is a way to establish clear rules of engagement within a group. At a meeting of environmental health and environmental justice leaders from around the world that Abby facilitated, it helped quickly surface issues of power imbalance. The team agreements exercise at the beginning of the meeting made space for delegates from the Global South to assert their desire for a team agreement about prioritizing their voices during the convening. Even though the majority of people in the room were from the Global South, it was important to explicitly agree on this value as a group — in part because so many climate convenings fail in this regard. Prioritizing Southern voices became part of the group’s agreement, so Abby as facilitator could invoke that value and refer back to it to shift conversation as needed throughout the meeting. One of our most popular and easy-to-use tools is the Fabulous POP Model. POP stands for Purpose, Outcomes, Process—three things that you should identify before any significant action, whether it is a phone call or a major campaign. At the Sustainability Initiative, they often use POP as an agenda review tool, where after agreeing on purpose and outcomes for a meeting, the process is the agenda. For example, in the same meeting of global leaders mentioned above, the elevation of Southern voices was also one of the agreed upon outcomes for the day, which made it one of the metrics by which they evaluated the meeting at the end. Another example of the power of POP was when the Sustainability Initiative explored a new program on staff engagement on sustainability and climate. Although staff are often key to implementing such changes on campus, previous engagement work focused on faculty and students. At the beginning of the process, staff from six or seven units on campus all came together with ideas, and the ideas were all actions. Rather than diving in to sharing and evaluating those ideas, or doing a POP for each one, Abby led the group in a big-picture conversation about Purpose and Outcomes. This helped define the scope and audience for their work more clearly. “Doing a deliberate exercise on outcomes surfaced shared values that we all really cared about, of building community and having fun, and framing changes as ways to improve peoples’ lives, rather than limiting them,” Abby said. The exercise created clarity and alignment that allowed the group to discern more readily among the proposed processes that everyone came into the room with, and to come up with fresh ideas that they hadn’t thought of before. Usually after the POP, Abby’s teams work together to complete a DARCI Accountability Grid. DARCI is a way to delegate roles for a project and track who is responsible for what. It’s an acronym for Decider/Delegator, Accountable, Responsible, Consulted, and Informed. A DARCI grid is useful to track roles and responsibilities, and also to gauge the feasibility of a plan or the overall capacity of a team. “When we get to the A in the DARCI and the room falls silent, that’s when we know the proposed project is not ripe yet, or the POP needs to be further developed,” Abby says. “In the case of staff engagement, a key staff leader changed roles within our institution right in the middle of this process. With the DARCI tool, our group could very easily see that we didn’t have the people power without her as the A to bottom-line the proposed work.” That clarity allowed the group to avoid taking on the new endeavor without the resources to execute effectively. At this point, even the student clubs on campus are using the POP and DARCI tools. Abby recounts recently overhearing some student leaders at the Global Sustainability Resource Center on campus designing a meeting agenda that included “doing a POP DARCI” on a proposed advocacy campaign. “Training up young people to work with that level of sophistication and efficiency is one of the aims of the Resource Center, and it brought a smile to our faces to see that aim in action,” Abby says. Appreciative Inquiry (AI) is a well-established method for teams to develop cohesion and a positive vision of a shared future—it is a great way to start a meeting or retreat. Community partners from SERES, a sustainability leadership training program based in Central America, taught Abby to use the principles of Appreciative Leadership in her work. Our AI tool serves as an introduction and offers several sample questions. Abby has developed a reputation as a facilitator around campus, and she recently coached a colleague to use AI during the annual retreat of one of the departments in the School of Biological Sciences. The theme of the retreat was collaboration, and she recommended breaking the participants into diads of appreciative inquiry as the first warm-up exercise. It’s humbling to see how people like Abby are using our tools, teaching them to students and colleagues, and creating those ripple effects out in every direction. What are your favorite tools, and how have they made an impact on your work?